This show definitely has the feel of a more slice of lifey comedy show with yuri undertones. If I were to call it anything it'd be either what I named in the title or CGDYT, Cute Girls Doing Yuri Things. Ms. Vampire who lives in my neighborhood seems like a really safe production that knows the audience it wants to appeal to. The animation is simple and colorful, the characters have nice voices that match their personality, and there isn't much to go against expectations. Rather than trying to stand out from the crowd, the first episode has been a comfort watch. You will likely anticipate every plot beat, but watching the show feels enjoyable because of that simplicity. If you just wanted to see cute girls that like girls having a weekly event of the day style adventure, this seems like it will be your yuri fix. I could argue that this should be 3 stars. It really does nothing exceptionally well, I can see people finding Akari a bit too over the top, and this seems like the sort of anime you'd watch once then forget about, but honestly, considering it is following up yuri anime like Citrus that did a great job tackling heavier themes, I'm looking forward to something more lighthearted. I'll be sure to update this as the series continues. SPOILER ALERT!!! & Early Review. and her interactions with her friend, Akari Amano, who has an antiquated idea of vampires. Like when Akari Amano offers her blood to Sophie when she's getting low of a blood type in her refrigerator.and Sophia demurs instead ordering some over the internet. Akari Amano decides to live with her vampire friend, and thus hangs the tale. It's a fun, cute anime story 4/5 for some lack of originality, animation 5/5, voice acting is 4/5 for Akari Amano sometimes irritating voice. Artwork is 4/5, nothing groundbreaking here; intangibles 5/5. it's very cute and sometimes funny. It's a light, humorous, slice of life, vampire tale, which you should enjoy. 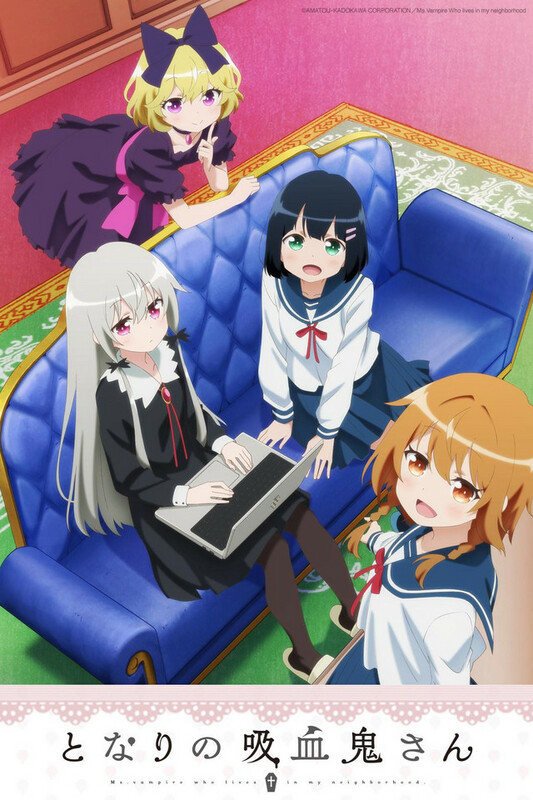 This show is a cute girls doing cute things show, so if you don't like that kind of show, you probably won't like this, the first few episodes have been and interesting a fun watch, if you're in the mood for some light-hearted fun I definitely recommend you give it a go. There's not much to say. It's good. It's very cute. A gentle, civilized vampire meets an extremely strange girl, and her life is turned upside down - But not in a bad way. It's a very relaxing show. It's a lot like Kinmoza, or Is The Order A Rabbit. Will update review when more episodes are released. End of the season note: The show ended up being exactly as I characterized it below - decent, but never truly rising to its full potential. Also, as many of those comedic shoujo ai's, it doesn't really offer much plot progression or real romance. I ended up liking the whole cast and had reasonable amounts of fun throughout the season, but the show never became truly brilliant, as I hoped it would - well-earned four stars. If you know and like Yuru Yuri, this series is a rare treat for you - a genuine shoujo-ai comedy with a lot of lighthearted "romance" and amusing gags. It follows a high school freshman, Amano, who gets infatuated with Sophie, a centuries-old loli vampire living in her neighbourhood. Sophie, being a recluse and a bit quirky (but also a very polite and genuinely kind person), is initially put off by Amano's pushy attitude, but gradually starts appreciating the new companionship in her previously lonely life and possibly even returning some of the Amano's feelings. Soon, two other characters show up - Amano's classmate who clearly has a crush on her and a vampire girl from Sophie's past, who pretty much considers herself Sophie's partner (although her feelings seem highly unrequited). All this creates a comedic love rectangle, playing out mostly in Sophie's mansion, while all she would normally hope for is a bit of peace and quiet. After finishing Yuru Yuri over a year ago, I was honestly starving for this kind of show and I was absolutely loving the first episode (even though the opening is a bit too saccharine and pushes the yuri a tiny bit too hard into everyone's faces - just compare it to the fun and quirky Yuru Yuri openings). The humour was pretty much spot on and excellently paced, with the weirdo human vs reasonable vampire dynamic working perfectly. However, I feel like around the third episode the show is already starting to run out of steam - while it's still entertaining, the writing is just not as good as I hoped for and the pacing got visibly slower. Also, while I really like Amano and Sophie, I'm still not sold out on the rest of the cast. In summary, this is definitely a worthwhile watch for all yuri fans out there and also anyone who enjoys the absurd, gag comedy anime such as Tekyuu. Still, at this point it falls just a bit from being truly great - thus, I give it 4 stars and I'm going to continue watching it, adjusting the final score if it picks up the right pace again. So good if you like cute stuff! Super cute story about a girl befriending a vampire that has been living alone, orders shipments of blood online and defies the traditional characteristics associated with vampires. Not a whole lot to say about it with only 4 episodes at the moment, but I can't wait to see more. Ahh, this was really what I needed. It has the right amount of humor, cuteness, and a peaceful vibe that makes me warm and fuzzy inside. Something about this reminds me of Is The Order a Rabbit. I'm not sure why, but it's one of the reasons I love it! Highly recommend for people who just need a breather in life. It is extremely cute and endearing. The characters are adorable, and I really have enjoyed the anime so far. I've watched 4 episodes so far. It's a nice relaxing show to watch before bed or in some free time. Nothing crazy, and nothing uninteresting, just a good show.